Hand-marbled in Italy, this acid-free paper features a stunning, one-of-a-kind array of vibrant colors that will add a distinguishing touch to any art or home decor project. The Stone Wave pattern takes a normal blue and orange stone marble look and adds wrinkles to the design creating a 3-D wave appearance. 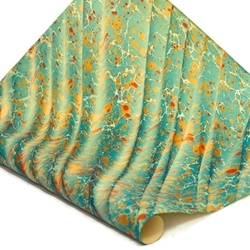 High-quality, acid-free wood pulp paper provides the base sheet to which the beautiful color palette and patterns are applied by hand. The Stone Wave pattern takes a standard blue, orange and cream stone marble look and adds wrinkles to the design creating a 3-dimensional wave appearance. This Italian Marbled Paper is available in sizes 6" x 6", 8.5" x 11" and 19.5” x 27”.